repairing or replacing, you are in the right place. First of all you need to determine what valve you have. On Airstream trailers there were two used from the factory. "work-a-rounds" for repairing Airstreams and Argosy's. there is a good chance there a quit a few work-a-rounds on your unit. tanks are somewhat hard to get down. And even harder to get back up. So if there a way to repair your unit and not take the pan down that is the way to go. 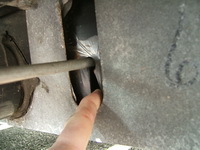 On the units where the dump outlet is right behind the RS (Road Side) tire, this "How-to" is going to be most helpful. Here is the bottom of the tank. You can see where the dump outlet is at the top of the picture. You are going to have to drill a hole in the bottom of this pan and you DO NOT want to damage the tank or the dump outlet piping. The way to do that is look inside the release handle openings like this. where drilling will not damage anything. This area ( in most cases) is about 12inch by 12inch and may be a little larger. 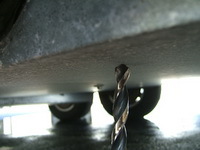 Then get a drill and only drill far enough to get the tip of a pair of tin snips through the hole. There may be some Styrofoam in here and you will have to pull it out of the way. 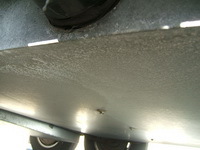 Regular old fiberglass insolation can be put back in it's place. Sometimes there are small wires (Tank Sensors) in here so be careful. When it comes to working on an Airstream you need a good pair of Aviator snips. Stick the tip of one of these in the hole you drilled and go round and round until you have a large enough hole to where you can see up inside the belly pan. 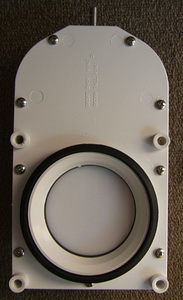 Once you can see inside of the belly pan you will be able to cut a larger opening so that you can work. when I get ready to put a piece of sheet metal back over this hole, with sheet metel screws, I will not come close to poking a hole in one of my tanks. Now that opening is as large so I can get to the valves I can take them out and repair them. However, a better idea, and what is really neat about doing it this way, you may be able to look at your Valves and tell what ones you need. Then order them and replace/repair them when your new ones come in. The two main ones that are in Airstreams are shown here. If you have a "Press to Fit" style then you can take it out and put the new one back. If you have a "Glue on" style, it may be repairable right where it is at. The reason you would want to do this is to keep from taking the tank out. You may be able to use a seal kit. Click here for the kit in our store. 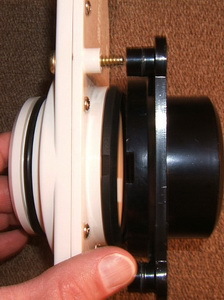 the part that is glued to the tank. Also, you may ask, why would you need to buy a new valve when there is a seal kit? The Valve is plastic and the parts ware out and leak. in the belly pans . This very How-to may apply here too. You will have to look at your unit and decide. Here is a link to that Valve.